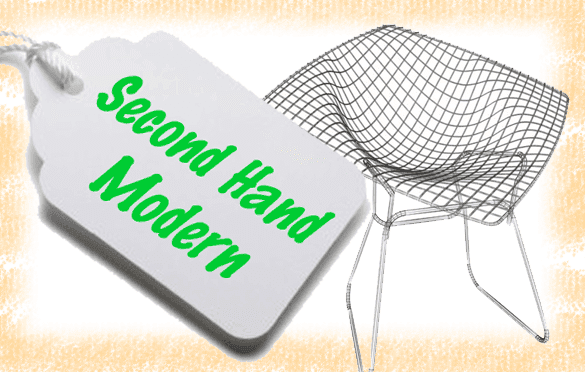 Looking for the best places to shop for bargains on hip and modern furniture and accessories? Historically the nearby markets of Kansas City, Denver or Dallas have been much more active for modern and retro shoppers. For many years sellers in Tulsa and Oklahoma City traveled or sought out buyers through online marketplaces like Craigslist or eBay. But today the local demand for cool swag is heating up. We spent a week traveling the Sooner State to find the second-hand shops that specialize in vintage, retro, modern and contemporary items. We discovered shops offering everything from kitsch to Case Study. But the most exciting discovery was the community of businesses making a go and keeping it local. Savvy entrepreneurs are staying close to home, setting up shop– even rejuvenating retail storefronts and neighborhoods. The end result is a shopper's paradise. If you know where to look. Here's our list of favorite and fun Oklahoma places to shop- in no particular order. 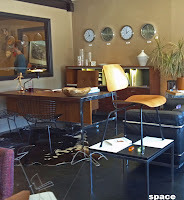 Furniture is the primary focus of this shop. There are some smaller items- but designer furnishings and office gear are the main inventory. And while you shop you can get a haircut! Mike Brown (no relation) has set up shop in the Plaza District. The store is loaded with a little bit of everything, but you'll find a great assortment of kitschy art and accessories. You'll find this shop tucked away in the shadow of Founder's Tower. But don't let the strip mall fool you- there's a ton of cool furnishings and lighting inside. Furnishings and decor from the Fifties and Sixties are the specialty here. 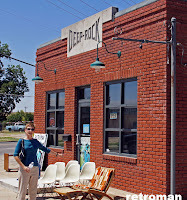 The historic location also makes this shop worth a visit- the building was Oklahoma City's first Deep Rock gas station. 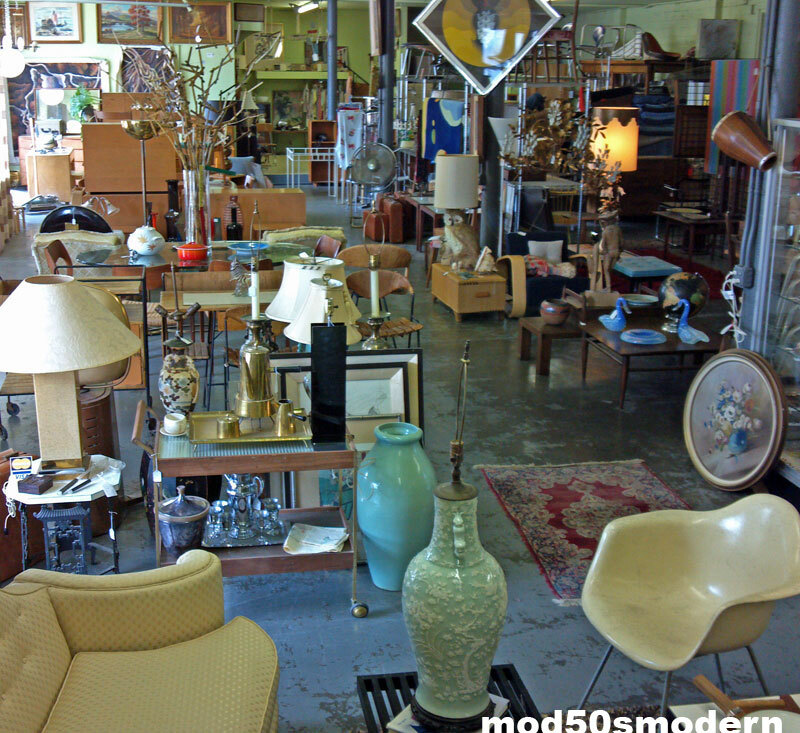 This shop is a potpourri of furnishings and decor from the Forties through the Seventies. Funky and kitsch are their specialty here- and you'll find an eclectic array at reasonable prices. Maurice Powell has been searching out designer furniture and decor for more than 20 years now. 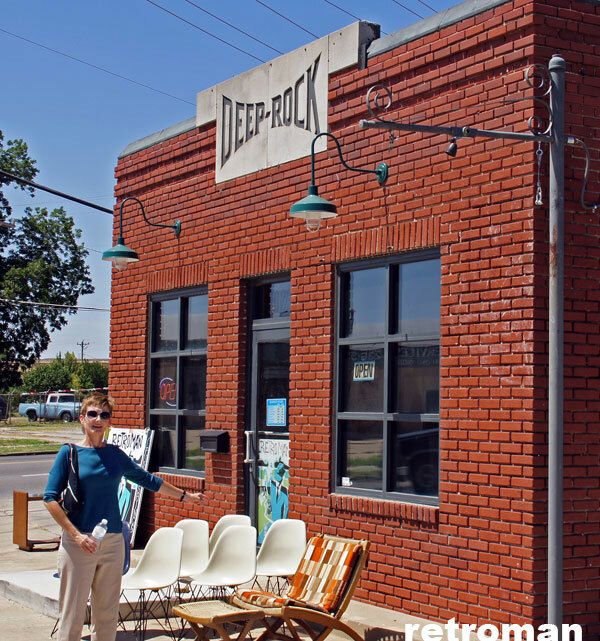 Formerly known as Deco to Disco, his shop on Cherry Street is a treasure trove of famous names like Eames, Heywood-Wakefield and historic Oklahoma artwork. Like the name says- lots of retro decorative items. Plus furniture, wall art and lamps. Located just west of 31st and Sheridan next to Mall 31. Got more time than money? Hidden treasures await you at the local thrift stores. But be prepared to dig through a whole lot of... um, not treasure. 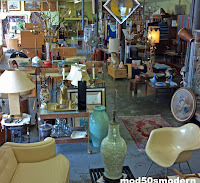 Area antique malls are another fun place to seek out the hip and groovy. In fact, many of the shopkeepers we met on our rounds had started out with a booth at their local antiquary. Prices are usually better due to lower overhead, but you have to dig and will most likely need to get your hands dirty. And don't forget to check the classifieds for estate sales! You can find some great bargains- plus get to see a cool house. Look for sales located in neighborhoods built in the Fifties and Sixties for the best combinations of shopping and impromptu home tour. There's more! I admit it: I'm a geek and I love maps. So after the rave reviews of our Oklahoma Modern Map we decided to make another one just for cool places to shop! This map includes stores that offer new merchandise, clothing, etc. Feel free to leave a comment with any suggestions you have for other modern Oklahoma outlets. THANKS Oklahoma Modern! I appreciate it, here, down at mod50s modern! Love your posts!